Following the popularity of our recent classical music concerts in 2016 and 2017, we are delighted to announce another evening of music here at Owlpen. This time it's an evening of string quartets by Beethoven, plus a surprise, performed by the Richter Ensemble. The event will take place on October 31st at 7.30pm, bar opens at 7pm. We have been busy compiling our new menu for 2017 Christmas parties here at Owlpen. Our chef Raoul Moore says, "we have something for everyone here. If you want the traditional Christmas Turkey dinner it's all yours, or for pescatarians I'm offering roasted fillet of sea bass. And Lady Mander's signature puddings are mouth-watering this year, as always!" Thanks to our partnership with Tetbury wine merchant Vinotopia, we are offering our house prosecco as a complimentary welcome drink, and our wine list has just bee given a re-vamp too. Lots to be excited about this Christmas! As the leaves slowly begin to change colour, so does the colour scheme chosen by our lovely brides at the weddings here at Owlpen. Roses give way to sunflowers, emphasis on greenery more than flowers, and of course the backdrop of Owlpen is never quite the same as each beech tree slowly responds to the changing season. Looking forward to more wonderful celebrations as the evenings draw in, which means more fariy lights, lanterns, fire bowls and, of course, a few blankets! We are delighted to announce a special one- off event here at Owlpen. In partnership with the Passaglia Duo, we proudly present an evening of baroque music at Owlpen Manor, on Tuesday August 8th! Local musicians Annabel Knight and Robin Bigwood return to Owlpen on a break from their busy global concert schedule to share with us a double-bill of music by Bach, Handel and Telemann. Tickets are available online or through the Owlpen estate office. See flyer below for more information. See you there! Although the summer does not officially start until the solstice, it certainly feels as though the season is upon us here in our little valley at Owlpen. As our wedding guests enjoyed the gardens yesterday the mercury rose to 26 degrees, hotter than Spain or the south of France. Thankfully there is plenty of shade under the yew trees, some of which were planted over 400 years ago. Read more about Summer is here! We had a visit from the BBC today. 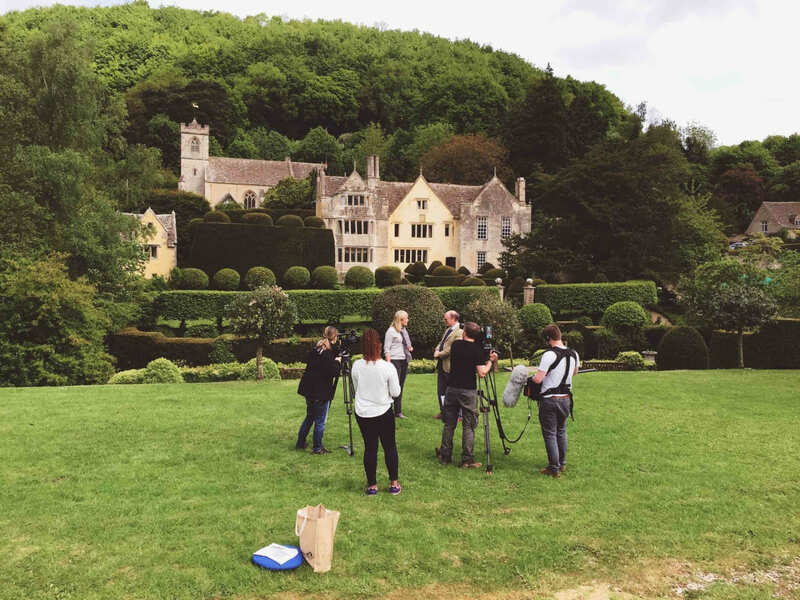 They are filming an episode of "Escape to the Country" in the Cotswolds, and asked to come to Owlpen to film a history section for this episode. Sir Nicholas Mander has been busy talking to Nicki Chapman about manor houses, Cotswold gardens adn the Arts and Crafts movement, not to mention the odd ghost siting... More details to follow! We were delighted to receive notice of a recent painting of Owlpen by Mr Ronald Whiting recently. He began this work many years ago, and only recently rediscovered it and decided to finish it off. Thank you for your beautiful rendition of Owlpen! This winter we had a visit from the Oxford Dendrochronology Laboratory, who made use of the scaffolding provided by our film crew to access the ancient cruck trusses in the Cyder House. The team used specialist drills to bore into the heartwood of the trusses, to establish the precise date when the trees, used to support the massive Cotswold stone roof of this Grade 1 listed building, were felled.